The online user-generated encyclopaedia Wikipedia is considering a radical change to how it is run. It is proposing a review of the rules, that would see revisions being approved before they were added to the site. The proposal comes after edits of the pages of Senators Robert Byrd and Edward Kennedy gave the false impression both had died. The editing change has proved controversial and sparked a row among the site's editors. 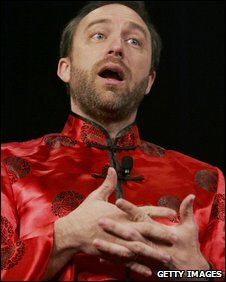 Wikipedia's founder, Jimmy Wales, is proposing a system of flagged revisions, which would mean any changes made by a new or unknown user would have to be approved by one of the site's editors, before the changes were published. This would mean a radical shift from the site's philosophy that ostensibly allows anyone to make changes to almost any entry. In a blog entry, Mr Wales said the "nonsense" of the false reports would have been "100% prevented by Flagged Revision" and said he wanted the changes to be implemented as soon as possible. However, this posting caused a storm of comments on his site, with many editors saying the proposal was unworkable. One user posted that "Enabling Flagged Revisions will undoubtedly create backlogs that we will be unable to manage" while another said that there were "gaping holes in what you propose to do". Mr Wales has now offered a compromise, asking those who were opposed to the changes to make "an alternative proposal within the next 7 days, to be voted upon for the next 14 days after that." A system of flagged revisions has been used by the German Wikipedia site for almost a year. However critics say that the process is labour intensive and some changes can take days, if not weeks, to appear.